The 2019 scholarship applications are now available! Check out the details below. The IIA Baltimore Chapter offers scholarships for all interested accounting, finance, information systems, or other business-related field (i.e., economics) undergraduate and graduate students. See below for details of each available scholarship. The Baltimore Chapter awards three scholarships totaling $6,000. The individual values of the scholarships that are awarded are $3,000, $2,000 and $1,000. The 2019 application is available at the following link: Undergraduate Scholarship Application. The Baltimore Chapter awards one scholarship in the amount of $3,000. The 2019 application is available at the following link: Graduate Scholarship Application. This program is a great way to develop and prepare you for a career that focuses on helping organizations make their business processes better controlled and more economical, efficient, and effective. The Internal Audit Track, which includes Introduction to Internal Auditing, Advanced Internal Auditing, Information Systems Security, Audit and Control; Fraud/Forensics Auditing; and Enterprise Risk Management (ERM) courses; among others, will help you sharpen the skills necessary for a career in internal auditing. More information about the program is at the following link: UMD MS Accounting - Internal Audit Track. This program is designed primarily for individuals who want to strengthen their understanding of internal audit and prepare for the Certified Internal Auditor examination. Students who pursue this post-baccalaureate certificate may also use the coursework as part of the M.S. in Accounting and Business Advisory Services program. More information about the program is at the following link: UB Graduate Certificate Internal Audit Services. Raven Global Training offers a virtual, live CIA review course using the IIA's CIA Learning System. On site/ non-virtual live course offerings are also available. More information about the program is at the following link: Raven Global Training CIA Program. 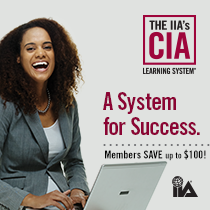 The IIA's CIA Learning System teaches the entire global CIA exam syllabus in a convenient and mobile format so you can make the most of your valuable study time. 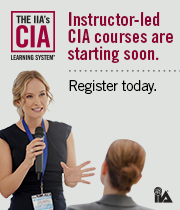 The IIA offers both self study and instructor led CIA courses. There is discounted pricing to Baltimore IIA Chapter members. Click on one of the images below for more information and to sign up. Gleim has a CIA program that more potential CIAs turn to pass the CIA exam than to any other provider on the market. Gleim offers discounted pricing to Baltimore IIA Chapter members. More information is available at the following link: Gleim CIA Exam Prep. Copyright © Baltimore IIA Chapter 2017 - 2019. All Rights Reserved.